Dagupan, from the word "nandarugapan" or a place where people meet, the trading center of Northern Luzon, now gets a boost as it joins the ranks of information and communications technology (ICT) hubs in the country. 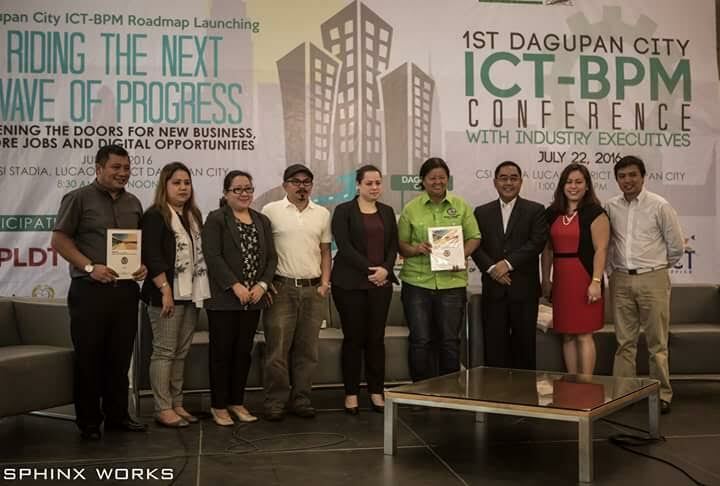 Compos Mentis President Jonathan De Luzurriaga formally turned over a printed copy of the Dagupan City ICT-BPM Roadmap to Dagupan Mayor Belen Fernandez and Wilson Manalo, vice president of the Dagupan ICT Council, last Friday, July 22, in the presence of all the local stakeholders. De Luzurriaga, who is also currently the president of the Philippine Software Industry Association (PSIA) led stakeholders in a comprehensive study of Dagupan's potential, strengths, areas for improvement and corresponding relative to its goal to generate ICT-enabled jobs and investments. Early this year, Dagupan emerged as one of Top 10 Next Wave Cities in ICT-BP! in the Philippines as ranked by the Information Technology Business Process Association of the Philippines (IBPAP) and the ICT Office (ICTO) of the Department of Science and Technology, which is not currently a separate department, the Department of Information and Communications Technology (DICT). Fernandez, presenting the vision of the city, assured everyone that Dagupan will worked immediately on addressing the concerns and implementing the strategies found in the roadmap, especially on the aspect of creating a information technology (IT) zone, and support facilities, developing talent, and ensuring full government support to the Dagupan ICT Council. She called on all sectors to support the roadmap, and encourage them to "re-write" the history of Dagupan, by not only being the Bangus (milkfish) Capital of the Philippines but also an ICT-BPM Hub of Luzon. The launching was marked by a series of industry talks attended by about 1,300 students from Dagupan and neighboring towns and cities in Pangasinan. National ICT Confederation of the Philippines (NICP) former president and current trustee Jocelle Batapa-Sigue spoke about the need to create jobs in the countryside in order to uplift the economic condition of communities outside of Metro Manila.